DHAKA, Jul 21 2011 (IPS) - Phulo Rani Pal checks for loose dust around her open backyard kitchen. It’s time to prepare the sweets she supplies to vendors and it will not do for her products to be contaminated. Four earthen burners going, Rani works her secret magic recipe for four different types of boiled confections, locally called ‘toy sweets’ that are popular with children. A dozen experienced hands, led by her eldest son, are there to help, but the 57-year-old grandmother fusses over her pots and stoves to ensure a perfect blend. Her confections, in geometric and animal shapes, have never been returned by vendors in the 27 years she has been in business. It all started in her ancestral home, in the Hindu-dominated Palpara village of Savar district, in 1983 when she took a small loan from a local non-government organisation (NGO) called Village Education Resource Centre or VERC. Q&A: "Microfinance Is Much More Than Just Credit"
Initially she became eligible for a loan of Taka 5,000 (66 US dollars) shortly after she joined a ‘samiti’, or group, of about 20 women. To qualify for a beginner’s loan members must have their own savings scheme, and accordingly Rani would deposit 0.06 cents at every weekly meeting of her group. VERC and other NGOs operating in Savar, located some 50 km from the capital, act as channels to help improve lives of the poor. They work to ensure that every group member advances to a level above the poverty line. A blend of regular advocacy and training is essential for this move out of poverty. Loans, often thought as essential, are actually resorted to as a last option. “We try to build the right type of awareness and talk closely to individual beneficiaries so that we are able to understand their real needs,” says Nasima Aktar, area supervisor from VERC. Nasima maintains regular contact with every member in her area of roughly four to five neighbouhoods. “We advise beneficiaries to start small and gradually grow so that in the event of failure beneficiaries have room to recover,” said Nasima. For Rani escaping poverty was not easy. When she started the toy sweets business she had a hard time selling her products to vendors. “On successful repayment of my first loan in 45 instalments in 12 months I thought I would continue the business despite the marginal profits. I could sense bigger profits in the future as I had no competitor. So I focused on quality, which I still maintain,” recalled Rani. Before Rani became a member of the group her family had no regular income. Her husband was a day labourer and she had a hard time raising her three sons and giving them a patchy education. “VERC staff members recognised my talent for making toy sweets and encouraged me. 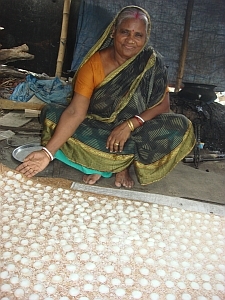 VERC supported my expansion plans by providing me timely loans,” said a smiling Rani. Rani marks her real success from the point where she became eligible for VERC’s Micro-Enterprise programme that provided bigger loans to expand her business. Her family grew alongside. She now lives in a joint family which includes 17 of her grandchildren. Her home on a 50 sq metre-plot is ringed by a bamboo fence, and is among the biggest in the neighbourhood. In all, Rani availed of 30 loans from VERC’s microfinance programme – the biggest of them worth 5,280 dollars. Today vendors come to her door, travelling up to 300 km to place orders and buy stocks of toy sweets which are in great demand during the winter festival and the fairs that are a feature of life in Bangladesh. On average Rani makes about 264 dollars a month from the sale of toy sweets. That is considered princely in Bangladesh, a least developed country (LDC) with a population of 142 million people. Among the criteria the United Nations uses for classifying a country as an LDC is one which says it must have a per capita annual income of less than 76 dollars a month. Rani puts aside 6.6 dollars for the weekly meetings of the 20-member group of which she is leader. Her group has savings worth more than 3,960 dollars kept in a local bank account. Members may deposit any amount, but receive a share of the interest from the bank, or from individual borrowers, according to the size of their investment. Until May this year VERC had 324,000 borrowers from 5,353 groups who had borrowed 67.5 million dollars. Recovery of loans from members is almost 99.96 percent, which means VERC has no defaulters. More than 10 million borrowers are estimated to have changed their lives through microcredit programmes, launched soon after the liberation of Bangladesh in 1971. The best tribute to the success of Bangladesh’s microcredit programmes is that they are now being replicated in many countries of the world.